Producing plants is made easier by using the best cloning machines on offer. With the help of advanced technology that helps the cuttings develop stronger roots faster, cloning machines are invaluable. The machine can adapt to all types of gardens; whether it be soil based or a hydroponic variety. An investment in a high-quality machine like these will definitely make your garden astonishing and more than memorable. How To Choose The Best Cloning Machines? 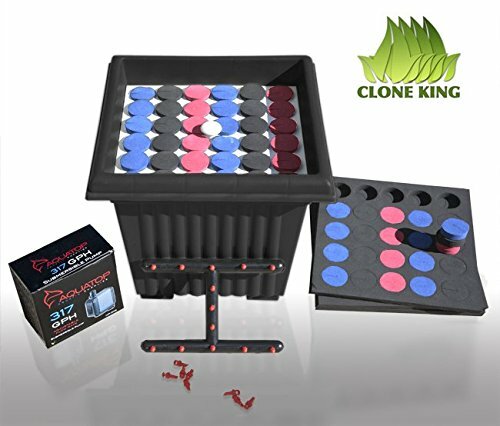 Highly reviewed by tons and tons of growers, the Clone King Aeroponic Cloning Machine is top-notch. It is the quality machine at a surprisingly affordable price. This machine makes cloning plants a lot easier and quicker than traditional cloning manual practices. It makes use of an Aeroponic Cloning system which provides the efficiency and accuracy that gardeners are really looking for to ensure growth and sustainability. The roots on the plant cuttings are easier to develop. In just 3-5 days with the methodology, by hanging the plant while spraying with an oxygenated Aeroponic solution, we can see its growth flourish. The product is easy to use, comes with an easy to understand manual and guide. The simple to follow guide allows for easy set-up of the machine and the instructions on how to run it, without wasting too much of the gardener’s time. It will assure your guaranteed satisfaction even if the price is more affordable than most other cloning devices, unbelievable right? This product has really been designed to exceed your expectations and to deliver what it says. This includes plugs for cuttings, 13 head mister, and things for you to achieve that astonishing garden you always wanted. The machine is available with many different sites 25 site, 36 site (most popular) and 64 site that can help accommodate the clones. Within just 5-10 days you can have some healthy rooted clones with the help of a unique Aeroponic cloning system called Clone bucket. It is faster than traditional cloning and definitely can clone your preferred plants, comes with a bucket and guarantees success if instructions are followed. 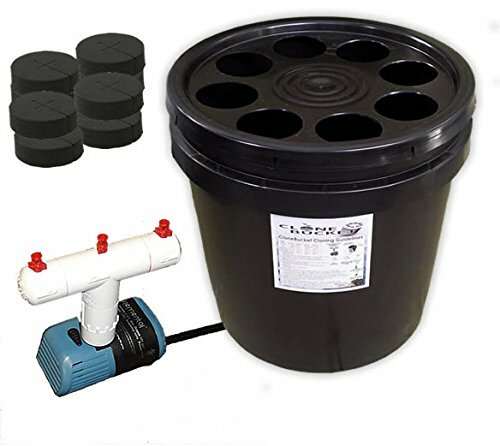 With the help of the Aeroponic misting design, you just have to assemble the water pump and place the cuttings at the top of the provided usable inserts then open the pump and just let it be for best results. 1st is the CloneBucket 1.0 Econo 6 Site good for growing strawberry plants and other starting seeds. The machine assures that no algae will grow inside it due to the strong black bucket and lid. Transplanting into the soil or hydroponic systems is easier because it includes 1 ¾ Net Cubes and RockWall cubes. 2nd is The 8 clone site model that has an Aerophonic cloner accompanied by neoprene inserts inside which are reusable. Furthermore, it does not require any ports and has a diameter of 1 5/8 inches which is good for small volumes. 3rd is the ﻿﻿﻿18 c﻿﻿﻿lone site version for larger capacity. Cooler temperatures are best for Aerophonic clone machines, with 6 cycles or up to 8 months being the average duration of the Vita Grow samples. For those who wish to clone plants without the use of soil and other complicated growing mediums then you can use the Turboklone system. 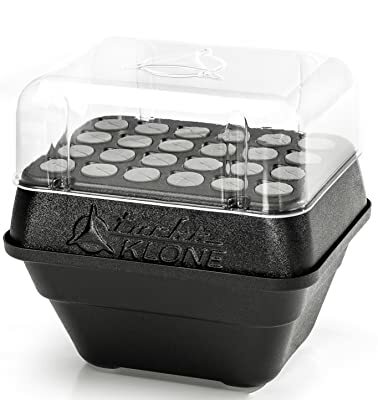 The TurboKlone makes use of a process called Aeroponic cloning, essentially a process that allows for much quicker and more efficient cloning. It sprays life giving oxygenated water continuously so that the plant may reach maximum quality much quicker. The Turboklone exceeds other cloning machines output due to its unique design of curved walls, rounded edges, and sleek design which ultimately gives it a more high quality feel. The sleek and rounded design is not just for appearance but also will make the Turboklone easier to clean and assist in reducing bacterial growth. Pest and diseases may damage the roots but the machine is designed to minimize this eventuality, so it’s perfect for use, even in a growing environment. It also fights hot temperatures due to its inbuilt fan technology that provides oxygen inside the chambers and circulates air in the unit. The fan system is well protected inside the machine preventing the wires to be tangled up and ultimately crossing each other. Reduced maintenance and its ease of use make this machine my favorite pick. It is also not surprisingly the favorite of many home gardeners and not only is it better than other machines in terms of weight and size but it’s also reasonably priced. The space saving design and low profile characteristics of the cloner will give you more sites, making the Turboklone a powerful tool in successful propagation. The Turboklone also comes with 24 Site and 48 site to match your needs. There are many things to consider as picking the best cloning machine like the price, and the gardener’s overall requirements. Moreover, you should ask the question what components or features does the machine have that the potential cloner can use to increase productivity and efficiency. However, ultimately it’s up to your preference and budget. So choose the machine that can adapt to your needs going forward. There are 2 kinds of hydroponic system that can be bought, the DWP or Deep Water Culture and the Ebb or EAF and flow. The EAF will do the better in terms of dry-loving plants and is a better choice while DWP is for beginners with a more simplified hydroponic system. The number of sites will depend according to the system of the cloner that you finally decide on, so you will need to think a little about the overall amount of plants that you want to grow well before choosing a cloning machine. Plants grow at different rates and so considering the bucket size which it resides in is a must. The bucket measures per gallon so for easier transplanting always pick the larger one if possible so that the plant will be easily transferred and released from the cell. An active hydroponic system improves you cloning venture and is more suitable choice than a passive variety, so make sure if you can afford it to invest in an active hydroponic system. An expandable kit offers the gardener much greater flexibility and much greater growth for your garden. These expandable devices cost a little bit more, but the initial investment will surely outweigh the problems associated with being unable to scale your operations. 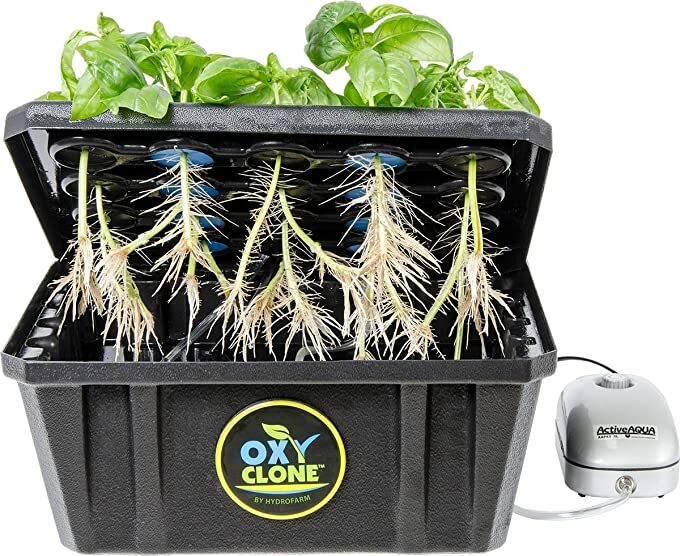 Finding the best and most suitable cloning machine for your garden is hard, but with the reviews written above, hopefully it will be easier for you to find the best fit for your needs. Once you decide to buy one the instructions below will guide you on how to maximize the effectiveness of your cloning machine. The instructions inside are easy to understand and will direct you on how to set up the machine. Fill it with water, attach the pump and misters, and make sure it covers the surface of the lid. Humidity domes or misting helps set up the right cloning environment but is only necessary when humidity is less than 60%. You will need to ensure that the temperature is always around 20 degrees Celsius for your nutrient solution. It’s not hard to maintain as long as the pump does not overheat. Plants need the perfect amount of light so make sure that your cloning area receives some, a few grow lights inches away from canopy would assist a lot in this regard. After assuring that the lights, temperature, humidity are okay and the set-up has been done as per the instructions provided, you can now set the cutting into the cloning system. Once you know how to collect the cuttings, you can now place them into the disk provided by the machine. You just have to make sure that the cuttings are 2 inches at the bottom of the inserts. First few hours: Monitor the cuttings every few hours to see if everything’s alright after putting them into the machine. At first, the plants may look dry, but after sometime, they will freshen. If not you can always use some mist using a foliar spray. First Couple of Days: After 2 days the plant’s roots will start to grow. You need to ensure that they have bright white color because it’s a sign that they’re healthy and more likely to develop. A brownish color can be acquired if the water temperature is not right, so, consider adjusting the reservoir. After a Week And On The Tenth Day: After a week, the cuttings will now have many healthy long roots and are now ready for transplanting, but waiting for a few days is better where the primary roots and cuttings produce a secondary root system. After 10 days you can now see the secondary roots, which means now is the best time for transplanting. The best cloning machines on the list above promise absolute good performance and with just a little bit of effort can make your garden astonishing. With the variety of choices, it’s pretty hard to pick because they can all exceed your expectations. My favorite is the Aeroponic plant cloner because of its many great features. It can keep plants at their optimum level, to ensure its maximum yield. It’s easy to clean because of the rounded design not only that; it’s also affordable. All of the products presented above use advanced technologies that will definitely take care of your plants. Investing in one will not hurt your pocket because all outlined are affordable. A passionate and serious gardener like you needs useful products like these to help your garden flourish. All systems are proven and tested and please feel free to comment and share your experiences.